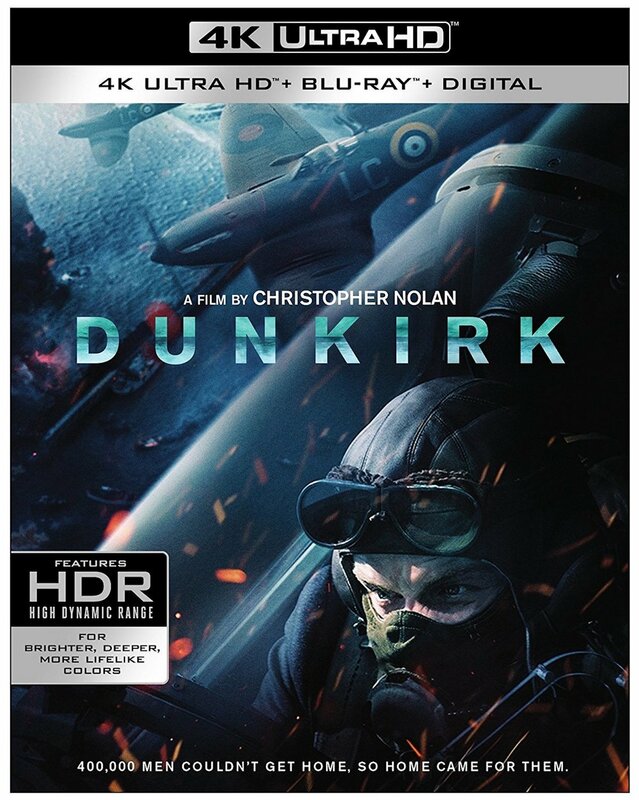 "Dunkirk" (2017), UHD. A Warner Bros. release. Video on this one is UHD (4K) with HDR-10. Audio is DTS-HD MA 5.1 48kHz. There are no Extras on this UHD. Won the Oscars for: Best Film Editing, Best Sound Editing, and Best Sound Mixing. REFERENCE QUALITY PQ AND AQ!! Writer/Director Christopher Nolan has called his new blockbuster an "experimental" film; and that is both its genius and its problem. This shortish film (only 106 minutes) *IS* an experiential masterpiece. But that is accomplished at the expense of traditional story-telling and character development. It will not appeal to everyone, particularly if you come to it thinking you are about to see a typical, Hollywood-mytholgized, period history film. Ya know, with big name stars the audience can root for! INSTEAD, you are subjected to unremitting chaos and ever-building tension. It's like taking the climax of a NORMAL film and extending it to full feature length! A major piece of this is the truly astounding audio track: Music, effects, and ambience combine to keep ratcheting up the stakes. The surreal musical score is unbelievable! There are bass notes here which stand their own against any of the explosions! So how DO you hold a climax together for 106 minutes? Well this is where the experimental nature of the film comes into play. Nolan has constructed three interlocking story lines which operate on THREE DIFFERENT TIME SCALES. First is the story as experienced by the soldiers trying to evacuate the Dunkirk beach -- before their rearguard, defensive line falls. That plays out over a 1 WEEK time frame. Second is the story as experienced by the fleet of little ships; as represented by one pleasure boat in particular (and the closest the film gets to actual character development, in yet another stunning performance by Mark Rylance). This plays out over a 1 DAY time frame. And third is the story as experienced by the RAF fighter pilots trying to afford some protection to the soldiers trapped on the beach and the ships trying to rescue them. This plays out over a 1 HOUR time frame! TRIVIA: The 2nd story line -- showing action on one of the little ships, with Mark Rylance as its owner/captain -- is inspired by the actions of Charles Lightoller, who at age 66, piloted his own motor yacht as part of the Dunkirk evacuation -- refusing to let a Navy crew take the risk in his place. This is the same Charles Lightoller who was 2nd Officer of the ill-fated, RMS Titanic -- the most senior surviving member of its crew. As stated, the three story lines interlock; with actions in one story later shown from a DIFFERENT perspective in another. Viewers not forewarned about this are likely to be flat-out puzzled what the heck is going on until they get the hang of it! And even then, you have to pay attention to realize what you are seeing is indeed action you've already seen before, but now from a different point of view. Again, because the film is rather short (for a blockbuster), and entirely devoted to building the tension, simultaneously, in all three of its story lines, this is not really all that tough for the audience once you get the idea. But it *IS* different! VERY different. And again, viewers expecting traditional film story telling may be put off by this. Personally, I found it FASCINATING. And extremely effective! And the Oscar Win for Best Editing was spot on, in my opinion. I've saved the best for last. As good as the audio track is in this film, the PQ on this HDR-10 transfer is even better! The movie was shot entirely on 65mm film. So you start off with higher resolution than 35mm. The roughly 80 minutes of the film shot with IMAX cameras are presented in 1.78 aspect ratio. The rest, shot in 65mm Panavision are presented in 2.20 aspect ratio. (The changes in aspect ratio are not at all distracting -- more kudos to the editing.) ALL of this footage was scanned at 4K, and put through a 4K work flow. So detail in this transfer is simply incredible! Then the UHD grading for HDR-10 (High Dynamic Range) and WCG (Wide Color Gamut) was supervised by Nolan, himself. And it is a marvel! I want to make one point in particular: This transfer does *NOT* try to "show off" either HDR-10 or WCG. There's nothing distracting about how they are utilized. Instead, they are completely subordinate to the artistic intent of the story itself. Folks, this is how it is SUPPOSED to be done. Warner has every right to be proud of this disc.